Moxie and her black horse named Misty are a team. While Misty looks to the rest of the world like an old switchback nag, she really is a stealthy horse with lots of energy and, most important, magic. Moxie has magic too, at least when she wears her special pink boots. The boots are a symbol of who she is and what she stands for. Moxie and Misty and many other young people around the world are special caretakers of the otherwise abandoned and abused animals of the world. But there are so many of these suffering creatures that it takes a little bit of magic to make the rescue possible. Besides, the special place where these rescued animals go is a really big secret, a magical place only attainable through magical means. 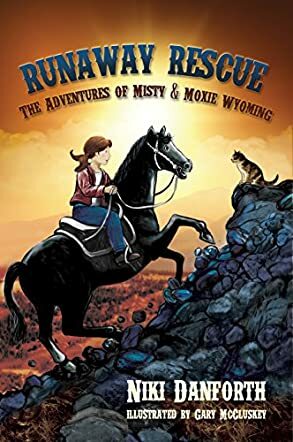 Niki Danforth’s middle grade adventure novel, Runaway Rescue: The Adventures of Misty and Moxie Wyoming, is the second book in this series. Since this is a continuation of the story, it’s good to discover that there is sufficient background story to allow the reader to understand what they have either forgotten or missed from the first book. The characters are both likeable, believable and well developed. The plot progresses at a steady pace with lots of action and adventure and, most important, lots of animals. Like the C.W. Anderson Billy and Blaze series of the 1930s, this series couples fascinating black-and-white drawings to entice the reader into the story. This is a wonderful story, actually a wonderful series, to introduce young readers to different animals and their special needs, and to teach them how to care for them and love them. The story has all the key ingredients of a good Middle Grade fantasy: animals, adventure and, of course, magic – magic for a good cause, which is saving the animals.